Earthsake's Pure&Local "Happy Sheep" Fleece Topper is here. Our newest topper offers pure sleeping bliss! The ultra-soft and plush premium eco-wool fleece is sourced from local family farms and made by hand in the USA. The organic cotton knit backing is a healthy alternative to chemical-laden tanned hides used on traditional sheepskins. The wool fleece stands about 1” high and offers significant benefits for individuals suffering from insomnia, chronic pain, fibromyalgia and more. Wool helps wick moisture from the body, and reduces heartrate by keeping the body temperature consistent and comfortable. Machine washable for easy care! Expect about 20-30% compression of the wool fiber, which is considered normal and natural. Create an amazing PillowTop Mattress simply by purchasing this incredible mattress topper. 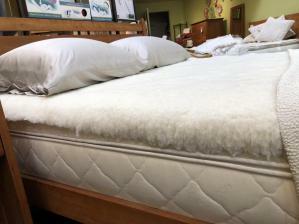 Our Pure&Local Wool™ mattress pads & toppers are completely chemical-free and beyond organic. Pure&Local™ Wool, is the same premium "Eco" wool we've carried for over 23 years from pure & local sources. This wool goes beyond "eco" and "organic" standards because it is 100% American from free-range "happy sheep" ranched in Northern California, Oregon and Washington. They are raised in outstanding natural and healthy conditions under strict organic standards and Pure Eco Wool standards. There are many certifications, trademarks, and standards that do not meet the Earthsake™ Pure&Local™ standard (and it's usually the local part) so these products have earned the Earthsake brand name using Earthsake's strict branding criteria. Accept no imitations - look for the Earthsake brand for pure & local perfection. At Earthsake we have completely chemical free & organic pillows comforters and plastic-free/vinyl -free waterproof puddle pads made with Earthsake Pure&Local™ ingredients to complete your bedding the right way. All natural - all comfortable - all pure & local. Create an incredibly comfortable pillowtop mattress out of any mattress with one of our great 100% natural, Pure&Local mattress toppers! You may also remove any covers or protectors and expose the pad or topper to Sun & Air every 3 months for one hour on each side. Use mother nature's air and sun for regular refreshment. Knit backing is organic cotton and some variation in color is normal. Using the natural properties of Pure&Local Wool™ our pads and toppers keep you cool in the summer and warm in the winter so you'll sleep soundly in any season...all without bringing unhealthy toxins into your world. It cushions magnificently, is ultra-absorbent and breathable, and its pure ingredients make are chemical free. The plush cozy softness will alleviate pressure points as it wicks away body moisture. The organic cotton knit backing is a healthy alternative to chemical-laden tanned hides used on traditional sheepskins. The wool fleece stands about 1” high and offers significant benefits for individuals suffering from insomnia, chronic pain, fibromyalgia and more. Our Pure&Local Wool also reduces heartrate by keeping the body temperature consistent and comfortable. 100% natural and chemical-free - ALWAYS! Pure & Local - ALWAYS! While others may claim to be 100% "Natural" or "Organic" or "Eco-Friendly", they often do not use Pure&Local wool™ and there is a world of difference: First, we require LOCAL American wool from the closest local suppliers, shepards, & organic farmers available that follow strict free-range and organic standards we helped to develop. Second, most wool, whether "organic" or not, is put through a harsh chemical cleaning process called "carbonization". Earthsake's Pure&Local wool™ is NEVER carbonized. Most people who believe they have an allergy to wool are actually reacting to the process of carbonization. Our Pure&Local™ Wool has been tested with even the most sensitive individuals and the only reaction they had was pure comfort and luxurious feel! Go ahead - Experience intense comfort and cushioned bliss. Discover the difference between our Pure&Local™ Wool and other so-called "natural" "organic" "pure" "eco" wools. You will be amazed! The organic cotton knit backing is also a healthy alternative to chemical-laden tanned hides used on traditional sheepskins.